is more efficient than a struggle from a distant land"
1: Were the Oslo Accords signed by the PLO as a long-term peace treaty with Israel? 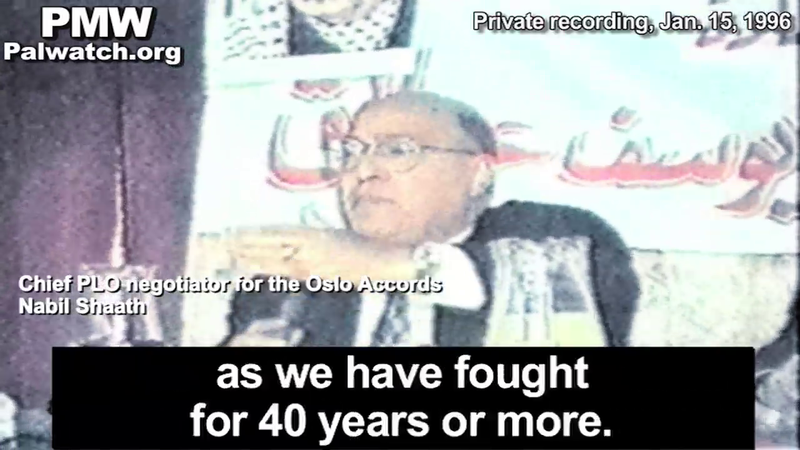 2: What did the PLO hope to achieve through Oslo? 3: Didn't Yasser Arafat commit to stop all violence? 4: Wasn't the 5-year terror campaign, the "intifada," a tragedy for Israelis and Palestinians alike? The PA's terror cost 1,200 Israeli and 3,000 Palestinian lives. 5: What borders does the PLO seek in a final status solution with Israel? PA and Fatah leaders answer these questions in videos and texts below. Today, September 13, is the 25th anniversary of the signing of the Oslo Accords. Prior to the signing of the Oslo Accords in 1993, Israel suffered from occasional terror orchestrated by the PLO terror organization, which was based 3,000 kilometers away in Tunisia. The signing of the Oslo Accords turned the PLO into Israel's close neighbor and enabled the establishment of Palestinian terror bases within striking distance of all Israeli cities. Since then, Israel has suffered from ongoing terror, terror campaigns, and terror waves. 1,600 Israelis have been murdered and tens of thousands have been injured from Palestinian terror since the Oslo Accords. For Israel, Oslo was a disastrous failure and an appalling tragedy. Not so for the PLO and its administrative arm the Palestinian Authority. Since the signing of the Oslo Accords in 1993, the Palestinian Authority leadership has made it clear to their own people that the goal of Oslo was never a long-term peace with Israel. 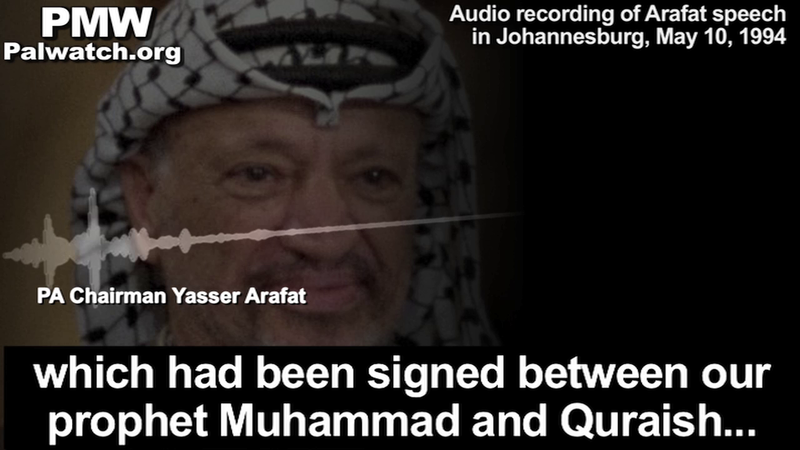 The model for Oslo, explained Yasser Arafat and many other PA leaders, was to mimic the "Treaty of Hudaybiyyah" - a 10-year peace treaty signed by Islam's Prophet Muhammad with the Quraysh Tribe of Mecca. The treaty did not last because two years after signing the treaty, Muhammad attacked, and conquered Mecca. The first stage of Oslo, PA leaders have explained, was transferring the PLO's base - which had been in distant Tunisia - to be inside "Palestine," together with the building of a military infrastructure in order to resume violence against Israel. The return to violence was the goal from the beginning. 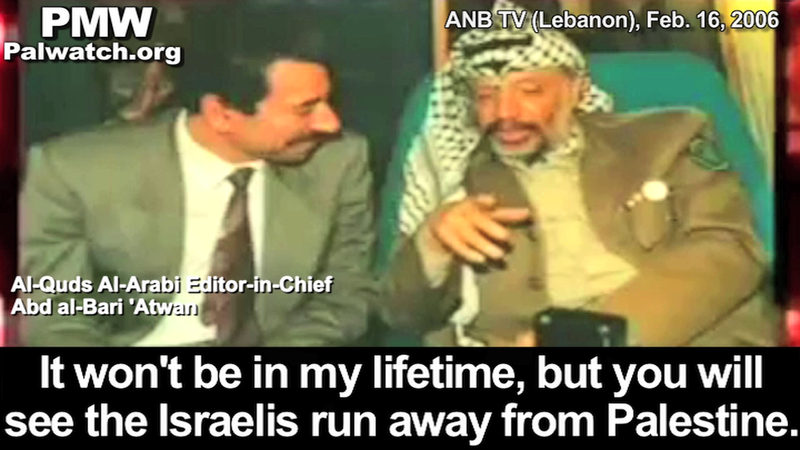 Arafat told a journalist that Oslo eventually would cause the Israelis to "run away." The 5-year terror campaign, the "intifada," which for Israel was the proof of Oslo's failure, was for the PA the proof of Oslo's success. Since the signing of Oslo and until today, Palestinian leaders have told Palestinians that "Palestine" is "from the Jordan River to the Mediterranean Sea" and encompasses all of Israel. The goal of Oslo, they have explained, is to increase the land under Palestinian control in stages. Israel will eventually disappear and be replaced by "Palestine." PA: The Oslo Accords were not intended to be a long-term agreement but were modeled after a peace treaty signed by Islam's Prophet Muhammad with his enemies. The Treaty of Hudaybiyyah called for peace for at least 10 years, but after two years Muhammad broke the truce and attacked and conquered his enemies. This was stated by Yasser Arafat himself a number of times, and many other Palestinian leaders. "This [Oslo] agreement, I am not considering it more than the agreement which had been signed between our Prophet Muhammad and Quraish..."
"The Palestinian leadership's sense of responsibility towards its nation made it take political steps [the Oslo Accords] about 20 years ago ...exactly like the Prophet [Muhammad] did in the Treaty of Hudaybiyyah... The Prophet said: 'I'm the Messenger of Allah and I will not disobey Him.' This is not disobedience, it is politics... In less than two years, the Prophet returned and based on this treaty, he conquered Mecca. This is the example, this is the model." [Arafat] told me: 'By Allah, I will drive them crazy. I will make these [Oslo] Accords a disaster for them. It won't be in my lifetime, but you will see the Israelis run away from Palestine. 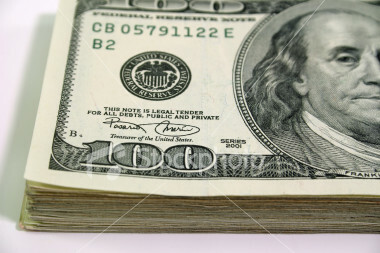 Have a little patience.'" "We might return to the 1967 borders by diplomacy, but we shall not return to the 1948 borders [i.e. eliminate Israel] by diplomacy. The 1948 borders- no one on earth recognizes as ours. Therefore we shall return to the 1967 borders, but we have not given up on [Israeli cities] Jerusalem and Haifa, Jaffa, Lod, Ramle and Tel Aviv... The land of Palestine will demand the Palestinians return as Muhammad returned- as a conqueror." PA: The PLO hoped to move its terror base from Tunisia to within easy striking distance of Israel. "The Palestinian people accepted the Oslo Accords as a first step and not as a permanent settlement, based on the premise that the war and struggle in the land is more efficient than a struggle from a distant land (i.e. Tunisia) ... the Palestinian people will continue the revolution until they achieve the goals of the '65 revolution... (i.e., destruction of Israel)"
"We decided to begin liberating our homeland step by step. This is the strategy... If and when Israel says "enough," namely - "we won't discuss Jerusalem, we won't return refugees, we won't dismantle settlements, we won't withdraw to the borders," in that case it is saying that we will return to violence. But this time, it will be with 30,000 armed Palestinian soldiers and in a land with elements of freedom. I'm the first one to call for it. If we get to a deadlock, we shall return to the fighting and struggle, as we have fought for 40 years or more." PA: The PA's ability to launch and fight an extended terror campaign was proof of the success of the Oslo Accords. "Oslo is the effective and potent greenhouse which embraced the Palestinian resistance. Without Oslo, there would never have been resistance. In all the occupied territories, we could not move a single pistol from place to place. Without Oslo, and being armed through Oslo... we would not have been able to create this great Palestinian Intifada." Abu Al-Einein: "The arms that were used against the Israeli enemy in Gaza and in other places..."
Host: "More than 40,000 rifles." 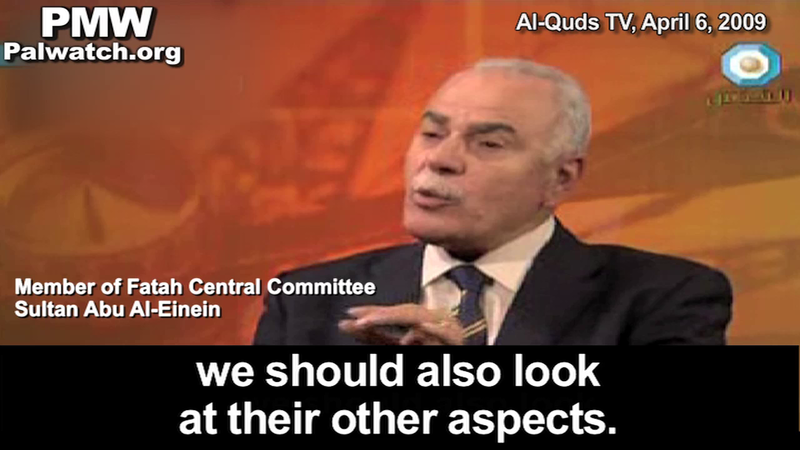 Abu Al-Einein: "Were brought [into the PA] in accordance with [the Oslo] Accords. When we refer to the negative aspects of the Oslo Accords, we should also look at their other aspects." 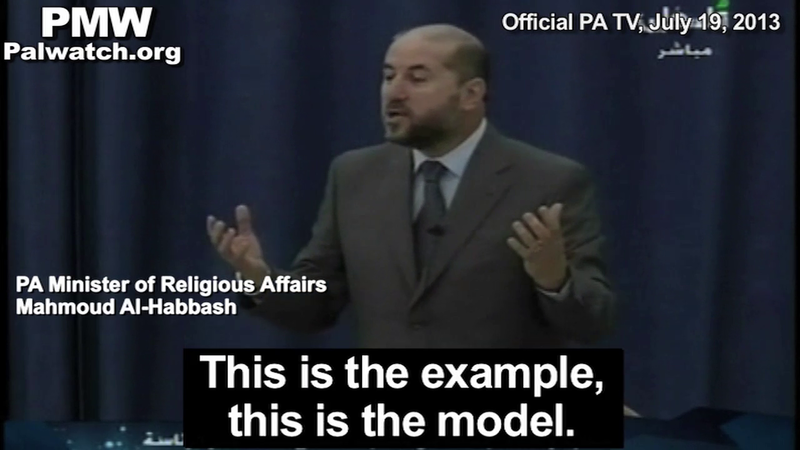 PA: The goal is for all of Israel to become "Palestine" in stages. "The goal of this stage is the establishment of the independent Palestinian State, with its capital in Jerusalem... Every Palestinian must know clearly and unequivocally that the independent Palestinian State, with Jerusalem as its capital is not the end of the road. The Palestinian State is a stage after which there will be another stage, and that is the democratic state in all of Palestine (i.e. replacing Israel)." "The Oslo agreement, or any other agreement, is just a temporary procedure, or just a step towards something bigger... We distinguish the strategic, long-term goals from the political staged goals, which we are compelled to temporarily accept due to international pressure. ... [Palestine] according to the higher strategy [is]: 'from the river to the sea.' Palestine in its entirety is an Arab land, the land of the Arab nation." 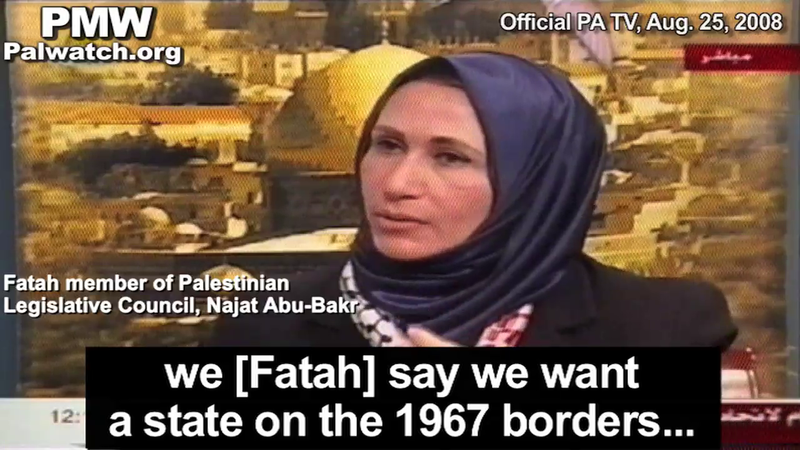 "It doesn't mean that we don't want the 1948 borders (i.e., all of Israel), but in our current political program we [Fatah] say we want a state on the 1967 borders... We [Palestinians] were created on this land in order to liberate it." "While the agreement [sought] is on the borders of June 4 , the President [Mahmoud Abbas] understands, we understand, and everyone knows that it is impossible to realize the inspiring idea, or the great goal [of removing Israel] in one stroke. If Israel withdraws from Jerusalem, if Israel uproots the settlements, 650,000 settlers, if Israel removes the (security) fence - what will be with Israel? Israel will come to an end. If I say that I want to remove it from existence, this will be great, great, it is hard [to say]. This is not a [stated] policy. You can't say it to the world. You can say it to yourself." "The Palestinian people accepted the Oslo Accords as a first step and not as a permanent settlement, based on the premise that the war and struggle in the land is more efficient than a struggle from a distant land... Without Oslo... we would not have been able to create this great Palestinian Intifada... We have not given up on [Israeli cities] Jerusalem and Haifa, Jaffa, Lod, Ramle and Tel Aviv... The Palestinian State is a stage after which there will be another stage, and that is the democratic state in all of Palestine (i.e. replacing Israel)... 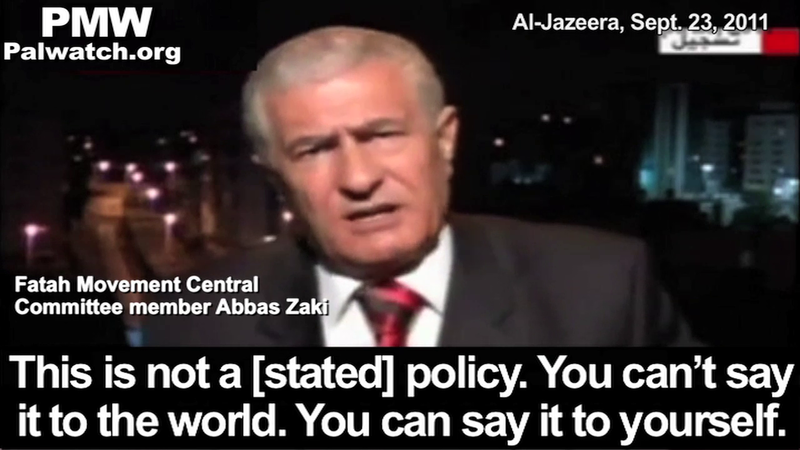 If I say that I want to remove it [Israel] from existence, this will be great... You can't say it to the world. You can say it to yourself."